Upgrade your street or track Genesis V6 with the all-new Mishimoto CNC-machined aluminum oil filter housing. The factory 3.8L Genesis uses a canister filter in the oil filter housing, which restricts the use of standard oil sandwich plates. This introduces a problem for those who frequently track their vehicles or who have modified vehicles that produce high oil temperatures. Our engineers developed the perfect solution: Replacing the entire oil filter housing with a lightweight CNC-machined aluminum housing allowing for the use of a spin-on oil filter and your choice of oil sandwich plate. 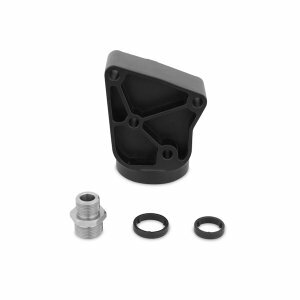 The Mishimoto Hyundai Genesis Oil Filter Housing kit includes the housing, stainless steel sandwich-plate adapter, and the appropriate O-rings for installation. This kit gives you the freedom to piece together your own oil cooler setup for unique mounting applications and for vehicles where our direct-fit oil cooler kit is not applicable due to space constraints. As with all our products, the Mishimoto Hyundai Genesis Oil Filter Housing includes our lifetime warranty.